WASHINGTON, DC, January 24, 2014 (ENS) – Thursday, opening day at the Washington Auto Show, was a feast for friends of sustainable mobility. For starters, U.S. Energy Secretary Ernest Moniz announced $50 million in federal government funding for fuel-efficient vehicles. The $50 million includes support for the Department of Energy’s EV Everywhere Grand Challenge, an initiative launched in March 2012 to make plug-in electric vehicles more affordable and convenient than petrol-powered ones within 10 years. Ford Motor Company Chief Operating Officer Mark Fields announced two different automated driving research projects – one with the Massachusetts Institute of Technology and the other with Stanford. The MIT project is based on predicting the movements of other vehicles and pedestrians, while Stanford researchers will focus on sensor technology that can see around obstructions. As for environmental stewardship, Fields pointed out that seven Ford brand vehicles offer fuel efficiency of 40 miles per gallon or better, due in part to environmentally friendlier materials used in manufacturing. “With the all-new F-150, advanced materials allowed us to shed 700 pounds,” he said. 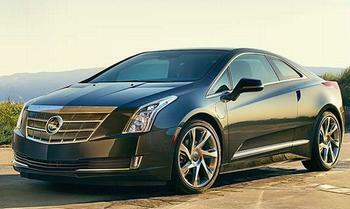 General Motors’ Cadillac ELR hybrid luxury coupe received the Green Car Journal’s 2014 Green Car Technology Award™. Regen on Demand allows the driver to use paddle shifters on the steering wheel to temporarily regenerate energy and store it as electricity in the battery pack for later use. The technology supports the ELR’s 340-mile total driving range. The Cadillac ELR “marries the fun-to-drive characteristics with electric propulsion and wrapped it in a beautiful package, Vurpillat said. The ELR is powered by a 154-horsepower electric motor (207 total system horsepower) that moves it from zero to 60 mph (96 km-h) in about 8.0 seconds. The ELR has a range on electric-only power of about 35 miles. A full recharge of the ELR’s battery takes about 4.5 hours. 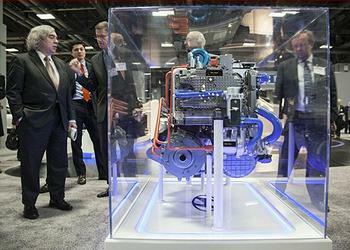 Toyota introduced its fuel cell-powered concept to the East Coast. The car is the result of Toyota’s 20-year commitment to fuel cell research and development and reflects the company’s accelerated goals for fuel-cell technology. The Washington Auto Show at the Walter E. Washington Convention Center is a showcase of more than 700 vehicles from over 40 manufacturers. It opened to the public on Thursday, January 23 and runs through Sunday, February 2.